Sen. Lindsey Graham of South Carolina, a leading defense hawk, is generally considered a conservative, although he has also angered many conservatives with his positions in favor of comprehensive immigration reform, climate change legislation, campaign finance limits, and seeking compromise with Democrats on the issue of judicial filibusters. His national security views have given him significant media exposure over the past decade, and his campaign is likely to focus on this issue in an attempt to stand out from the field. Graham is one of only a few military veterans running, and as a recognized leader on national security issues he may be able to attract significant support from Republicans who share and place a priority on his hawkish views. He has consistently opposed higher taxes and Obamacare and is a reliably conservative vote on most non-economic issues as well, but his deviations from some conservative positions on climate change and immigration could hinder his ability to reach beyond his national security base of support. He is closely allied with 2008 Republican nominee John McCain on many issues and has often been described as “pragmatic.” Both of these are likely to be used against him during the nomination fight by other candidates trying to claim the mantle of being the “real conservative” in the race. Despite more than 20 years in Congress and more than his fair share of media appearances, Graham’s national name recognition remains low in terms of a presidential run. His poll numbers have languished at the bottom of a crowded field, although his fundraising places him more towards the middle of the (very large) pack. He is a skilled campaigner and his ability to deliver memorably humorous or scathing one-liners could be all he needs to propel himself into the top tier of contenders. Graham is considered a long shot to win the Republican nomination, but he could be a contender if he turns in strong debate performances and is able to become the favored candidate of Republicans who list national security concerns as their number one priority. At present, however, Graham is struggling to get into even the second tier of candidates. 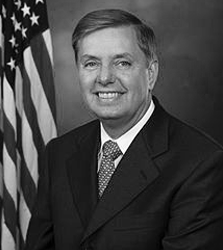 Lindsey Olin Graham was born on July 9, 1955, in Central, S.C., to parents Millie and Florence James “F.J.” Graham. Graham’s parents were owners and operators of a local restaurant that also served as a pool hall and a liquor store. Both of his parents died when he was relatively young. His mother died of Hodgkin’s lymphoma at age 52 — when Graham was only 21 — and his father died of a heart attack only 15 months later. Following his graduation from D.W. Daniel High School in Central, Graham became the first member of his family to attend and graduate from college. He also enlisted in the Reserve Officers’ Training Corps, who granted him permission to attend the University of South Carolina in Columbia to be near his orphaned 13-year-old sister, whom he adopted. Graham was a member of Pi Kappa Phi fraternity during his years at USC. He graduated in 1977 with a B.A. in psychology and received his J.D. from USC Law School in 1981. Following his graduation, Graham received his commission as an officer and a judge advocate in the United States Air Force. After serving for four years in Germany, Graham left active duty and joined the South Carolina Air National Guard in 1989. He returned to South Carolina, and there he entered into private practice as an attorney. Graham would continue to serve in the South Carolina Air National Guard until 1995 when he joined the U.S. Air Force Reserve. Graham was recalled to active duty during the Gulf War. He served at McEntire Air National Guard Station in Eastover, S.C., where he briefed departing pilots on the laws of war in his capacity as a judge advocate. He was promoted to colonel in 2004. He served in Iraq for two short periods in 2007, working on detainee and rule-of-law issues, and for a short time in Afghanistan in 2009. In May 2015 he resigned from the Air Force, presumably to allow him to run for president. Graham made his first bid for elective office in 1992, being elected to the South Carolina House of Representatives. After one term, Graham ran for an open seat in the U.S. House of Representatives in 1994. With the help of powerful U.S. Sen. Strom Thurmond, Graham won the GOP primary with 52 percent of the vote. He defeated the Democratic nominee by 20 percentage points in the Republican wave election of 1994. Graham was the first Republican to hold the seat since 1877. Graham easily won re-election to his seat several times before he ran for the U.S. Senate seat that was being vacated by Thurmond, who was retiring, in 2002. He ran unopposed in the primary, and defeated Democrat Alex Sanders, 54-44 percent. He was easily re-elected in 2008, won a contested primary in 2014 and then easily won re-election again. Graham has never been married. He is a member of the Corinth Baptist Church in South Carolina. Interestingly, Graham’s most recent rankings by key conservative groups such as Heritage Action and the American Conservative Union are actually lower than his lifetime and earlier ratings, suggesting he does not vote based on political expediency or pressure, but instead based on his own views. Efforts like this, and his willingness to work to compromise with Democrats, have earned Graham a reputation as someone who is not afraid to oppose his own party and interest groups Republicans typically cater to. Graham was accused in 1998 of exaggerating or misrepresenting his military service for apparently referring to himself as a veteran of the Desert Shield/Desert Storm campaign (first Iraq War).7 Graham was called up to active duty for that conflict but remained stateside. Graham had consistently stated he’d been stateside for his call up, however, so there is little reason to think this was more than a poor choice of words, as his duties were directly related to the military campaign. In 2011, the CEO of a South Carolina biotech company was indicted of embezzling millions of dollars from federal grants and funneling $31,000 in foreign contributions to Graham’s 2008 re-election campaign.9 The prosecutor said that Graham had no knowledge of the scheme and cooperated fully in their investigation, although press coverage did note that Graham had helped to secure nearly $20 million in federal grants for the company. Aside from these relatively minor incidents, Graham has never faced any serious and substantiated allegations of corruption or scandal or of dubious financial dealings while in office. His frequent appearances on television combined with his legal experience have made him a sharp and persuasive debater, and he is likely to benefit from the Republican presidential debates. He has frequently shown an ability to work across the aisle, being a member of both the “Gang of 14” (judicial filibusters) and “Gang of 8” (immigration). While he holds no high-profile leadership positions or committee chairs, he is widely regarded as a leader on issues related to national security and defense. That said, there is no signature legislative achievement to Graham’s name. Graham has faced few significant political electoral challenges in his career, winning most of his contests by double-digit margins. His most recent re-election to the U.S. Senate was his closest contested race, where he defeated Democrat challenger Brad Hutto by 5 points. Graham introduced the Job Protection Act, along with Sens. Lamar Alexander and Jim DeMint to preserve federal protection for states’ right-to-work laws, in response to the National Labor Relations Board moving to stop the Boeing corporation from building airplanes with non-union labor at a South Carolina plant.23 He also supported a measure to end collective bargaining for Transportation Security Administration (TSA) employees24 as well as amending the National Labor Relations Act to limit the power of the National Labor Relations Board.25 He also voted against so-called “card check” union organizing efforts that would effectively eliminate secret-ballot elections. Graham has been outspoken and critical of the Patient Protection and Affordable Care Act, aka Obamacare. He has sponsored several bills to defund and repeal Obamacare41 as well as measures that would have allowed states to opt out of one or more of the provisions of the law.42 He co-sponsored legislation expanding Medical Savings Accounts in 199943 (HSAs were created under the Medicare prescription drug benefit legislation he voted against). More recently he has suggested that means-testing for entitlement programs, presumably Social Security and possibly Medicare, should be part of serious reforms to safety-net programs. Graham, a veteran of the Air Force JAG Corps and Air Force Reserve, is outspoken in military issues and widely regarded as a defense hawk. He serves on the U.S. Senate Committee on Armed Services. Graham serves on the U.S. Senate Judiciary Committee. It is likely that these positions will draw challenges from Graham’s political right if he were to seek the presidency. Graham’s lack of a family will likely be raised by some as an issue in an effort to suggest he can’t relate to the needs of parents. His history of raising his sister after their parents died may be sufficient to put this issue to rest, however. A relatively spotless record in terms of ethical lapses or personal issues will likely force opponents to focus almost exclusively on his record of being out of step with conservatives on many issues, as well as the lack of a significant legislative accomplishment at which to point. Some have suggested he received preferential treatment in terms of Air Force promotions after being elected to Congress, but as one of only a few candidates who have served in the military it’s unlikely he can be successfully criticized on this issue by someone who has never served.